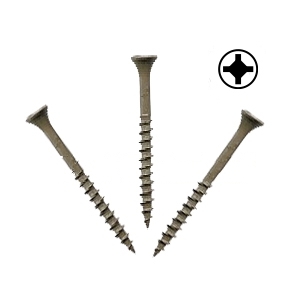 PRODUCT: #9 X 1-5/8" OUTDOOR / WOOD DECK SCREW, BUGLE HEAD, LIFECOAT /ACQ FINISH, QUADREX OR SQUARE DRIVE (inventory varies), PRICE PER 100. OUTDOOR WOOD/ DECKING AND FENCING ATTACHMENT OF CEMENT AND FIBER CEMENT BOARD TO STEEL OR WOOD. PASSES 1500 HOURS SALT SPRAY. BENEFITS: LONGER LIFE/HIGH ACID RESISTANCE/LARGER DIAMETERS TO REDUCE SNAPPING/SQUARE POSITIVE DRIVE RECESS/ ASYMMETRICAL THREAD FOR LOWER DRIVING FORCES. #2 SQUARE DRIVE BIT, 1 Inch LONG, 1/4 Inch HEX DRIVE, HARDENDED STEEL, RECESSED POINT DRIVER BIT. GUARANTEED QUALITY AND PERFORMANCE. PRICE/EACH. #2 SQUARE DRIVE BIT, 6 Inch LONG, RECESSED TIP, HARDENED STEEL, 1/4 Inch HEX SHANK POWER BIT (does not fit DS200).